Several years ago I posted a recipe for Santa Rosa Plum syrup and jelly made without pectin. This jelly is similar, but is made with satsuma plums and uses liquid pectin. It is a gorgeous and delicious jelly. 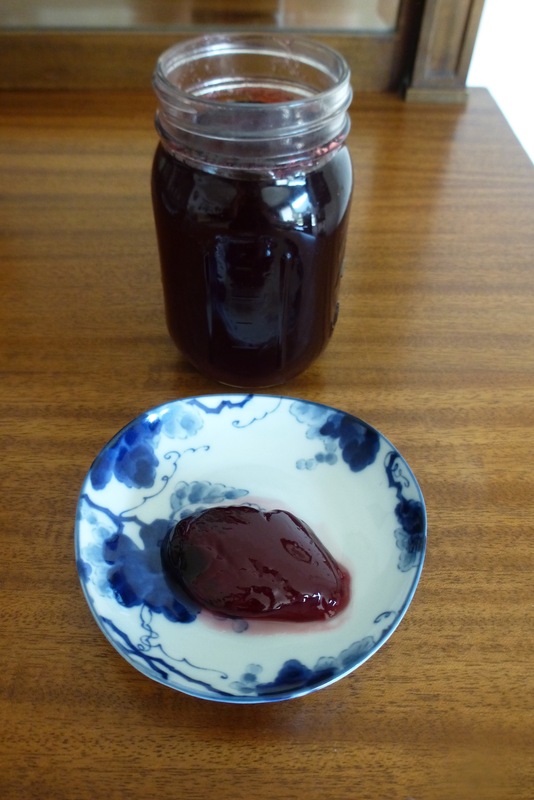 You need to use very ripe plums for this jelly to taste its best, so I let the plums sit out on the table to ripen for almost a week, then rinse the fruit and leave it whole with the skin and pit intact to make the plum juice. I often make the jelly in two steps. Day one – make the fruit juice and keep it covered in the refrigerator overnight. Day two – finish the jelly by adding the sugar and pectin to the fruit juice. After the jelly is water-bath canned it will appear as though the jelly has not set, because that stage takes time. It will be several weeks before it sets up into a thicker jelly. Combine plums and 2 cups of water in an 8-quart pot. Bring to boil on medium high heat, stirring often. Boil plums for 20 minutes, pressing the plums against the side of the pan with the spoon to release the juice. Pour into a cheesecloth-lined strainer with a bowl underneath to catch the juices. Let it drain for 20 minutes. You should have 2-1/2 cups juice. Boil two more cups of water and pour it over the plum leavings. Let it drain. You should have 4-1/2 cups plum juice. Begin by bringing a water-bath canner full of water to a boil. Dishwash 8 half-pint jars to sterilize them. Place lids in a one-quart pot. Cover the lids with water and bring to a boil. In a large 8-quart stockpot or jam pot combine 4-1/2 c. plum juice with sugar. On high heat bring to a hard rolling boil, stirring constantly. Hard boil for 1 minute. Remove from heat and pour in liquid pectin. Stir until pectin dissolves, about 2 minutes. Fill hot jars to 1/2 inch from the top. Wipe rims with damp paper towel and screw on lids. Waterbath for 15 minutes. Makes 8 (half-pint jars) or 4 pints. This entry was posted in Fruit, Jams and Jellies, preserving. Bookmark the permalink. No photos came through. I will have Scott email you.